This article is about the Italian chocolate maker. For the priest, see Michele Ferrero (priest). Michele Ferrero (Italian pronunciation: [miˈkɛːle ferˈrɛːro]; 26 April 1925 – 14 February 2015) was an Italian entrepreneur. He owned the chocolate manufacturer Ferrero SpA, Europe's second largest confectionery company (at the time of his death), which he developed from the small bakery and café of his father in Alba, Piedmont. His first big success was adding vegetable oil to the traditional gianduja paste to make the popular spread, Nutella. Michele Ferrero was born on 26 April 1925 in Dogliani, the son of Pietro Ferrero, who founded the Ferrero company, and his wife Piera Cillario. 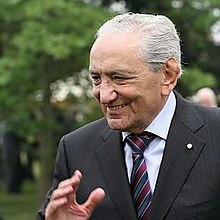 Ferrero joined the firm in 1949. He was the richest person in Italy, with a personal wealth of $26bn surpassing Silvio Berlusconi in March 2008. In May 2014, the Bloomberg Billionaires Index listed Ferrero as the 20th richest person in the world. Ferrero's brands include Nutella, Mon Chéri, Kinder Chocolate, Ferrero Rocher, Tic Tacs and Kinder Eggs. From 1997, his sons, Giovanni Ferrero and Pietro Ferrero, co-led the company. Pietro died on 18 April 2011, after an accident in South Africa. Giovanni became the sole CEO. Ferrero married Maria Franca Fissolo in 1962, and they had two sons together, Giovanni Ferrero and Pietro Ferrero Jr.
^ a b c "Michele Ferrero Forbes Profile". Forbes. March 9, 2011. Retrieved April 25, 2011. ^ a b c "The Story of a Family". Ferrero.com. ^ Various (30 October 2015). Hachette Children's Yearbook& Infopedia 2016. Hachette India. p. 37. ISBN 978-93-5195-041-7. ^ "Michele Ferrero compie 85 anni" [Michele Ferrero turns 85]. Il Sole 24 Ore (in Italian). 25 April 2010. ^ a b Hooper, John (28 October 2011). "Ferrero unwrapped: Italy's secretive confectioner opens its doors". The Guardian. Retrieved 14 February 2015. ^ "Bloomberg Billionares Index". Bloomberg LP. Archived from the original on December 14, 2012. Retrieved December 3, 2012. ^ Ferrero SpA – Company History. Fundinguniverse.com. Retrieved on 2011-11-03. ^ Forbes. Retrieved on 2014-05-18. ^ a b "Italian chocolate boss Ferrero dies in S. Africa accident". 18 April 2011. ^ Rhodan, Maya (15 February 2015). "World's Richest Candy Maker and Nutella Founder Died on Valentine's Day". Time. ^ "Cattedrale gremita per la Messa in memoria di Michele Ferrero - Gazzetta d'Alba - Dal 1882 il settimanale di Alba, Langhe e Roero". Gazzettadalba.it. Retrieved 2016-05-19. This page is based on the Wikipedia article Michele Ferrero; it is used under the Creative Commons Attribution-ShareAlike 3.0 Unported License (CC-BY-SA). You may redistribute it, verbatim or modified, providing that you comply with the terms of the CC-BY-SA.